Chevron, PNM, Big Money PACS Trying to Buy Key Elections. Buying elections. The American Way. You can express your outrage today at the Public Regulation Commission hearing at 9:30, with a Poor People’s Campaign Rally at 8:45. Read on to find out more about the hearing and your opportunity to testify for 3 minutes and the rally. “When you got that PRC election mailer that says Sandy Jones is “an effective watchdog” who “stands up to the powerful” guess who paid for it. PNM! PNM is the state’s largest utility and is regulated by Jones at the PRC. They are also the sole contributor to “New Mexicans for Progress” a PAC that is spending $440,000 to keep Jones in office with mailers and TV ads. And guess who put the message together for PNM. Governor Martinez confidant and Republican Strategist Jay McCleskey! Ouch. By having the donations flow from their parent company, this is somehow legal. But legal or not, this is as shameless as it gets. Talk about a purchased election. I am guessing that Lovejoy and Jones won’t show up at the PRC tomorrow, but if they do, use some of your 3 minutes in public comment to call them out. Public Regulation Commission Hearing Today to Consider Energy Mix for the Next 30 Years. This is HUGE. A chance to redirect the energy path for the next 30 years and a chance to expose the PRC for its utter failure to regulate PNM. Join us at 8:45am TODAY at the PRC (info below). Every 3 years Public Service Company of New Mexico is required to develop a plan for the next 20 years of energy investment, engage stakeholders throughout the process, and submit the results of the planning process – with the Most Cost-Effective Portfolio identified – to the New Mexico Public Regulation Commission for approval. The process is called Integrated Resource Planning. While PNM is not bound to the energy supplies identified in their plan, it reflects their long-range planning and forecasts our energy future. It also lays the groundwork for upcoming resource acquisition cases and subsequent ratecases. The 2018 IRP is no different. While they’ve included closure dates for the San Juan Coal Plant (2022) and the Four Corners Coal Plant (2031), the energy supplies they plan on bringing on board to replace the lost capacity are not the least cost options and have serious health, environmental, and financial cost and liabilities. This is a critical juncture in NM’s energy future. Coal is being retired and the state has the opportunity to finally chart a path toward renewables. That the PRC rules are that the priority is to favor the least expensive options, the continuously declining coat of solar and wind offers the PRC the opportunity to replace ALL of the retiring coal energy with renewables. 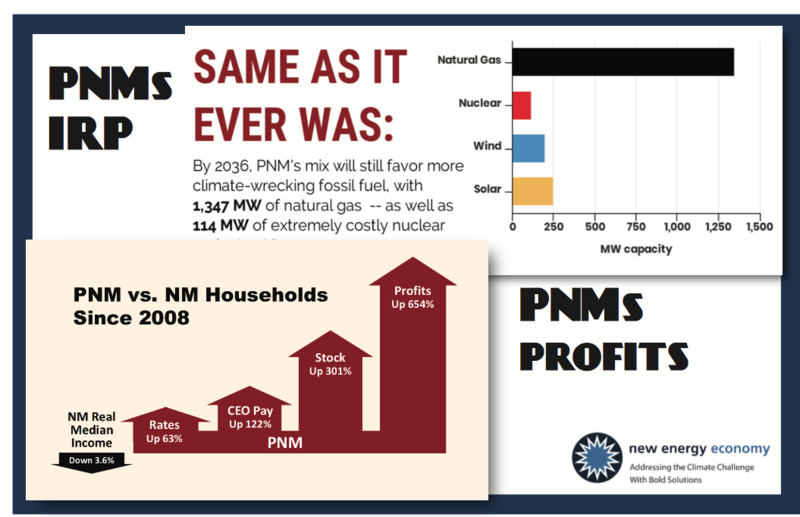 If PNM were not a for profit corporation that is what they would have proposed, but PNM is always guided by profit. And there is much more profit to be made from gas and nuclear than from renewables for one simple reason: PNM makes money, lots of money, on maintaining and repairing large expensive centralized operations than they do on decentralized and largely maintenance free solar and wind. So they cooked the books for nuclear and gas. As they have cooked the books for years to favor coal. How did they arrive at these energy supply recommendations over wind and solar plus storage? PNM’s modeling software inputs: 1) Artificially limited the amount of wind and solar possible – setting a cap on the megawatts the software could choose! There is no reason given for this, just simply that renewables would be limited to no more than 20% of the replacement energy; 2) Artificially inflated the cost of solar and wind well beyond today’s market prices and the bids they themselves have received. They also escalated the price of renewables over time when the reality is that solar, wind, and storage prices are steadily declining! 3) Completely omitted renewable energy storage! See New Energy Economy’s full analysis and testimony HERE. How can PNM expect to get away with this? Well when you fund the campaigns of the two key swing Commissioners (Sandy Jones and Lynda Lovejoy) to the tune of $440,000 for the current campaign alone, that provides at least part of the answer. As has been reported here many times, Jones and Lovejoy vote with PNM and other utility providers every single time, joining Patrick Lyons to form a 3-2 voting block that has over-ridden the PRC Hearing Officers every time. Lovejoy faces Janene Yazzie in her Dist. 4 primary and Sandy Jones faces off with former state senator Steve Fischmann. Today and tomorrow the PRC will hold hearing where you can testify for 3 minutes. The event has drawn the attention of the NM Poor People’s Campaign and they are staging a rally and reportedly some kind of direct action at the PRC hearing. See below. I strongly encourage you to attend. 8:45am We will be gathering outside of the PERA building for a quick prayer and rally with the Poor People’s Campaign and Tewa Women United. 9:30am – Public comment will begin. Public comment is open to any member of the public. Each person is allowed up to 3 minutes for comment. We will be in the hearing room on the 1st floor. PRC Commissioners may or may not be in attendance – but the Hearing Examiner, who presides over the case, considers and analyzes all of the evidence, and makes a recommended decision to the Commission, will be present to hear your testimony. If you cannot attend please consider signing the petition that will be submitted as testimony. Please, Paul and Roxanne, I hope you will publish a list of Retake’s endorsements prior to poll opening tomorrow.